I’ve been going a little persimmon crazy, I know, but when I said that persimmons were truly a versatile fruit I wasn’t lying. This post isn’t really a recipe as much as a “Look at What I Ate” post, but I thought it was worth sharing nonetheless. 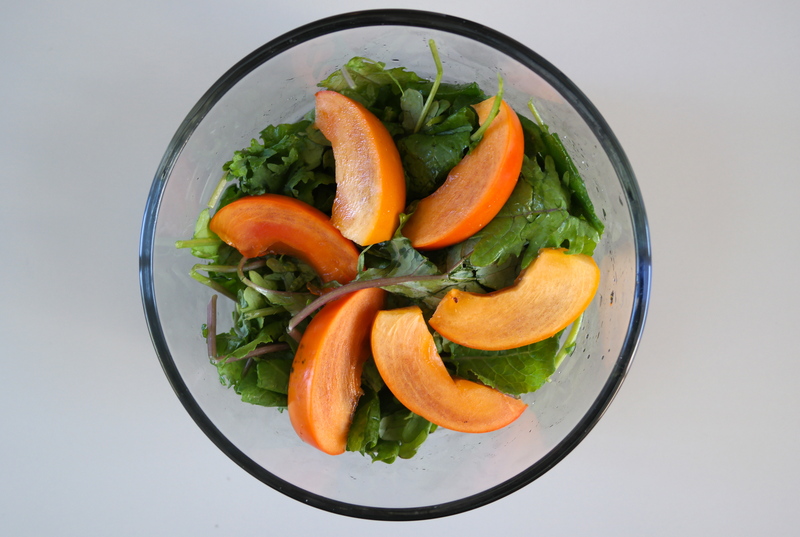 This salad was super easy to get together since I always have persimmons on hand. 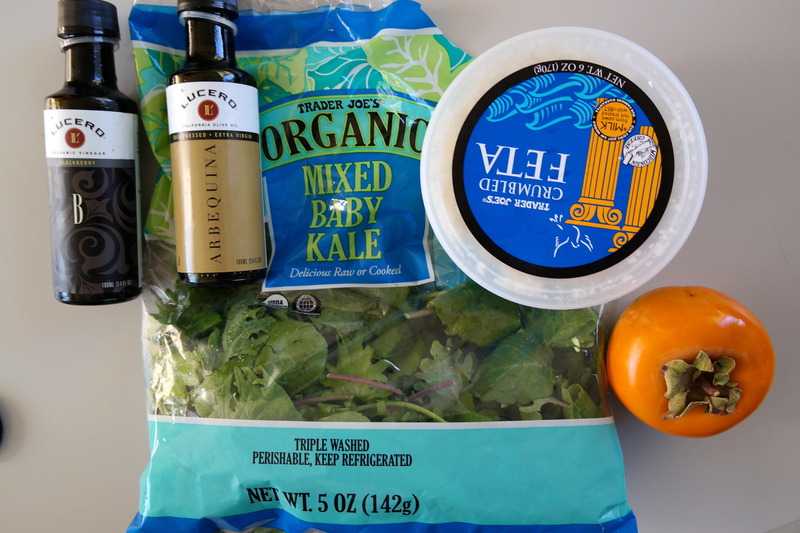 I had to buy the kale and feta since the dining commons (where I normally steal all of my ingredients from) only have spinach, and I was getting pretty sick of eating spinach a million times a week. Anyways, the baby kale was a nice change of pace and definitely worth the mini-splurge (greens can be kind of pricey!!). I ended up using the whole bag of greens by the end of the week by adding it to my miso soup (pictured here), which I have with breakfast or lunch most days. I’ve never been one of those people that are super into kale. Not baby kale, but the curly, monstrous kale that takes a good 5 minutes of chewing to be digestible/palatable. One day, a few weeks before I started the blog, I went out and bought a crap ton of kale because I had a grand plan to have my first blog post be called “Kale Day” and make a bunch of kale recipes. Kale Day featured kale chips with the curly kale, kale pasta with dino kale, and a kale smoothie with whatever was left. All of these recipes were flops. I had never tried kale chips before, but I’m pretty sure I made them right and they were still horrible. Horrible might be a strong word… but unnecessary would be more accurate. Sure, they were crispy and sort of mimicked chips for a good second or two, but the end result was just a lingering taste of kale. Kale pasta was actually not bad. The kale overpowered the dish as usual, but it seemed to belong in the pasta so I was okay with it. Again, the kale completely overpowered everything in the kale smoothie. In my opinion, smoothie’s should be a homogenous mixture of many individual ingredients that, when combined, taste better than they do alone and complement each other. That is not the case for kale smoothies. Any fruits you put into a kale smoothie, which are pretty good on their own, end up tasting like kale. Granted, the kale does end up being a little more palatable, but significantly enough to warrant the wasted fruit. Baby kale, however, is always a good option. It is everything I want kale to be: easy to chew, versatile, and not terrible. I don’t know if baby kale is a completely different variety of kale that is labeled “baby” because it’s smaller, or if it’s actually pre-mature regular kale. I have the same questions about baby corn, but I’ll address those concerns at another time. I had this salad for lunch alongside a half-sandwich left over from the day before. This made for a complete meal and added a nice fresh feel to my leftovers. I forgot to take a picture of it, but I actually added some pomegranate seeds to the salad halfway through eating it, which added great color and complemented it nicely. 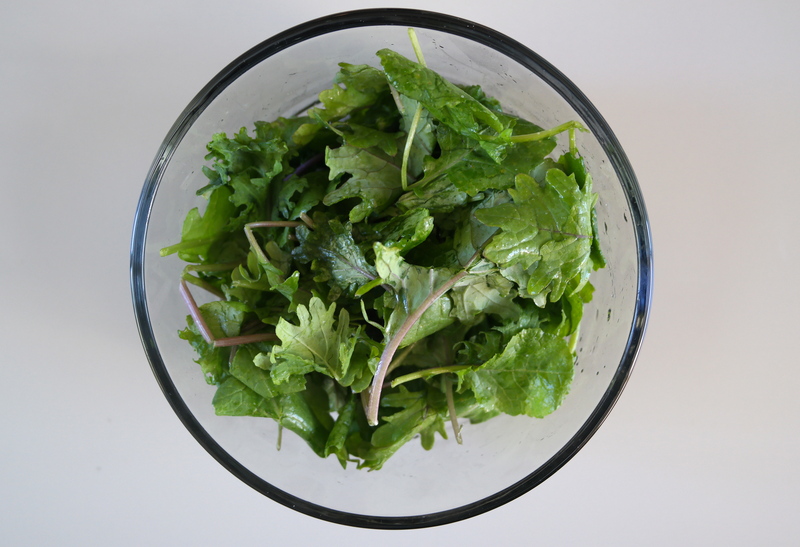 Massage ~1Tbs olive oil into the kale leaves in order to soften them slightly. 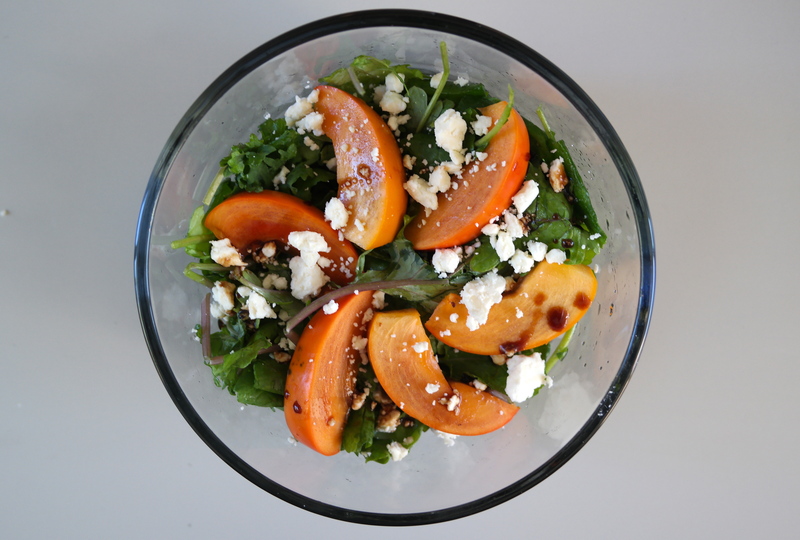 Add persimmons, feta cheese, a drizzle of balsamic vinegar, and pomegranate seeds (if using). Enjoy! !